When I was twelve, we received some unexpected visitors during the middle of the night. I gathered rather quickly they were hiding out from someone and needed a safe haven for a few weeks. I remember the woman’s name was Jean and she was about six months pregnant. Her “old man’s” name was Red. He was one of my father’s biker buddies. The fact they showed up late at night wasn’t odd. It was a common practice to have bikers show up at our house during all hours of the night and day for whatever reason. What I found interesting was what they were running from: a ghost. A couple of times, Jean had noticed a man peeking through the windows of the mobile home, or trailer, they were living in. Whenever Red would go outside to catch him, the stranger had always mysteriously disappeared. 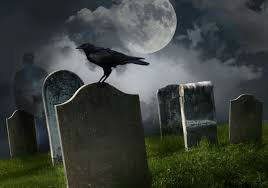 Both of them guessed that he had run into the graveyard next door to them and hid behind some of the tombstones. At first, she thought it was Red. After grabbing a nightgown from the dresser, she turned back toward the bed to scold Red for wearing his shoes to bed when the man sat up and smiled at her. It was the peeping tom. Screaming, Jean started running down the hall. Hearing her scream, Red, too, came running toward her down the hall. In hysterics, Jean told her husband the peeping tom was laying on their bed. When Red walked into the bedroom it was empty. They called the police who came out to do a report. “We get these calls all the time from people who rent here,” the officer told them. “It’s the same guy, same description every time. I am not saying it’s true, but I think it might be an apparition you’re seeing.” Jean believed the officer but Red didn’t. He didn’t believe in ghosts. The officer finished his report and then left. Upon entering the living room, the stranger, who was laying on the couch with this arms folded over him sat up and smiled at his hostess. It was the same peeping tom from the graveyard. When Jean turned to run down the hallway, she bumped into Red. “That’s him,” she yelled. “Where is he?” Red asked. Jean turned around and the couch was now vacant. Not only was it vacant, it was dry where it should have been damp from a soaking wet body lying on it. The puddles of water the man would have created from standing at the door were also gone. It was as if he was never there. Jean and Red quickly packed a bag and left. That’s how they ended up staying with us for several weeks until he could find another place. The owner of the mobile home, their landlord, admitted that, yes, many people have complained about the peeping tom/stranger and yes, he did believe the place to be haunted. Several years earlier, there had been an accident on that road only a few feet from the place. Several renters complained that the same guy would show up either already in their home or asking for permission to enter their home and it was always around 10 pm at night.